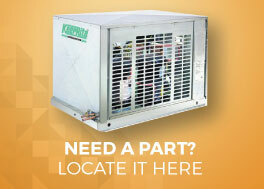 What is KeepRite Refrigeration Design Tools? KeepRite Refrigeration Design Tools is a suite of software applications created to help refrigeration professionals make accurate calculations, access product information, choose components and print technical drawings. Getting started is quick and easy. Just click on the Download button at the bottom of this page. Generate a load estimate for a refrigerated walk-in or warehouse and to select sufficient refrigeration equipment to handle the load. Select a condenser based on supplied design criteria, or select an existing model to see specification. (Suitable for single or multiple compressor applications.). Configure a single circuit Dry Fluid Cooler for free cooling or process cooling applications. Configure a single circuit Glycol Coil for use in walk-in coolers, refrigerated warehouses and docks. Generate one-off certified prints, approval drawings and specifications for all models in the equipment catalog. Generate parts lists for specified models, or usage lists for specified parts. Streamlined access to latest product support resources (specifications, installation, technical bulletins, promotional material).